Another Absolutely fantastic Cold Weather Destination is the Bacon Free Library. 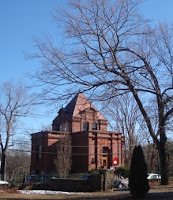 Located in South Natick Center over looking the Falls on the Charles River at 58 Eliot Street or Route 16, the Bacon Free Library is also the home of the Natick Historical Society and the "Museum of the Historical,Natural History"
First opened in 1880, The Bacon Free Library was funded from the estate of Oliver N. Bacon in memory of Mrs. Bacon, the first librarian. The first library was located in her home at 87 Eliot St. and then in a small brick building built in 1870 near the John Eliot Monument. The new library building was designed by Col. Robert G. Shaw. The cross and arrow iron fence represents peace and commemorates the early Christian Native Americans of South Natick. Built on the site of an Indian burying ground, The Bacon Free Library has the Eliot Bible as part of the museum's collection. John Eliot, "Apostle to the Indians" came to South Natick in 1651 and started a village of "Praying Indians" along the River. The village was a self governed community for over 50 years and remains today to be a beautiful piece of history open to the public for free. 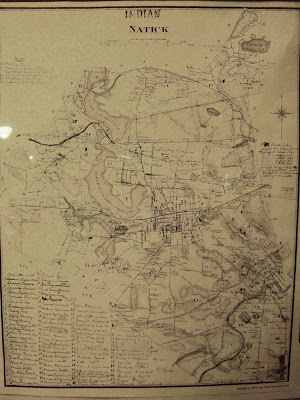 Maps of the early settlement can be viewed and copy's purchased. There is also a good sized collection of stone points and arrow heads to see. Their library of books about Massachusetts history is extensive. A fair amount of books have been reprinted and are for sale. The libray is open every day except Sunday and the museum on Tuesdays, Wednesday's and Saturday's. The Bacon Free Library is the perfect cozy spot to warm up and get a good look out its picture windows of the village. The window to the North West frames the Eliot Church beautifully. Its like looking at a 3D painting. Your visit to the village of South Natick will not be complete without a visit across the street to the Charles River Coffee House. Under a new management, Warm drinks to anybody's liking are served as well as a new lunch menu. Visiting South Natick will most defenetly have you smiling. You will have a chance to learn something new and of course another chance to take the day off from the indoor trainer! How sweet is that?